Gumbo Groove's music is an adventure in genre bending. We call it Fungrass, played on traditional acoustic instruments. Snatches of David Grisman-like riffs give way to New Orleans second line simmers, while shades of the Grateful Dead can be heard wending amongst the chordal carousings. Always friendly, always fun, Gumbo Groove is a musical incident looking for a place to happen. Frank Sprouse- guitarist, writes and arranges the band's mostly original music. After playing electric guitar most of his life, he now loves playing his Alvarez-Yairi DY62C dreadnought over multi-textured grooves. His influences include Dave Matthews, Monte Montgomery, Steve Kimock, with a grateful nod to Jerry Garcia. His dexterous acoustic playing takes Gumbo Groove to unique places, and his riffs and rhythms help to fuel GG's musical adventures. Steve Mosher- acoustic bass, builds his own instruments and his own line of speakers called Sonuspheres, all amazing to behold, and he's just as comfortable playing four string as six or eight. With a long history of band membership from jazz to rock w/ all stops in between, he provides a solid and complex foundation for the explorations of Gumbo Groove. His musical vocabulary is deep, and his influences range far and wide, from Phil Lesh to Stanley Clarke. Kathy Mezger has been playing in bands since high school. While living in Eugene in the 80's she was part of the acoustic group Wolf Creek and sang jazz with numerous bands in the Eugene and Portland areas. In Northern California she was a member of the band of women called Foxes in the Henhouse, specializing in tight three and four part harmonies. 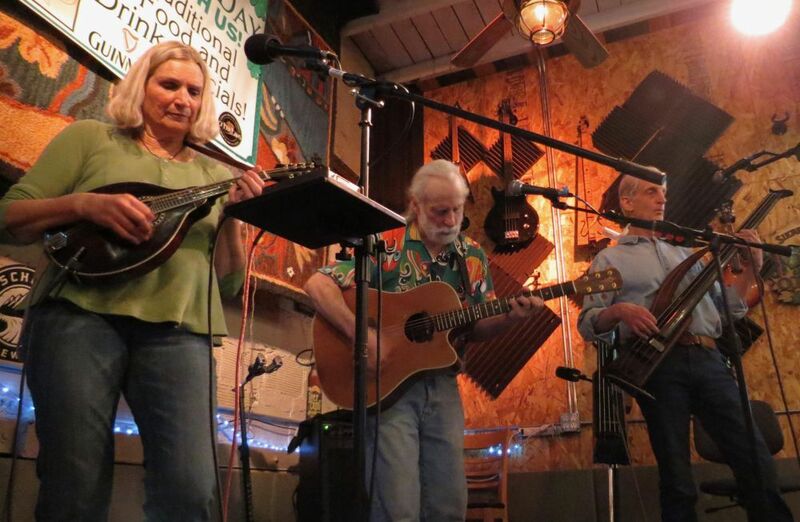 Kathy plays mandolin and guitar, adding her supple voice to the top end of Gumbo Groove's vocal profile.